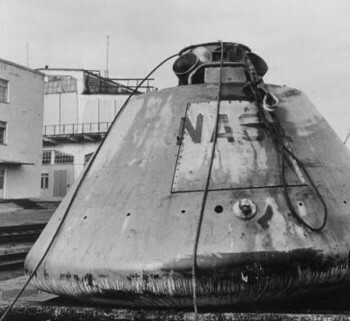 In 2002 the Encyclopedia Astronautica uncovered the forgotten story of the recovery of an Apollo capsule by the Soviet Union and it's return to the United States. The original March 2002 article provoked an early example of international group-research on the Internet, with a June 2002 update and with new information from the crewmembers of the USS Southwind in 2008. Now, 13 years later, Eddie Pugh's exhaustive research provides the definitive account of the event. What follows is, to my best knowledge and belief, an accurate description of a bizarre event from 1970 that saw an Apollo boilerplate capsule fall into the hands of the Russians. In preparing this account I must thank two ‘old timers’ from the former Landing and Recovery Division (LRD) of NASA whose patience with my repeated queries is gratefully acknowledged; former crew members of the USCG Southwind; crew members of various vessels involved with Apollo recoveries and serving members of the US military; and a Russian space enthusiast who eventually uncovered an interesting report of capsule 1227’s recovery. All have been unstinting in their help. A failure to resolve exactly what happened over forty years ago is entirely due to my shortcomings, not theirs. Apollo boilerplate capsule designated BP-1227 was one of a series of about thirty capsules that were designed to simulate the weight and external characteristics of the Apollo Command Module. They were used primarily to train recovery crews of both Navy and ARRS (Aerospace Rescue and Recovery Squadron) units in flotation collar installation and recovery procedures in the Atlantic and Pacific Oceans. There were some exceptions to this though. In addition to these roles, boilerplate BP-1202 was used at the Kennedy Space Centre (KSC) by an ARRS unit and KSC fire-fighters to train for launch site recovery, while BP-1224 was used in a Component Level Flammability Test Program to test for design decisions on selection and application of non-metallic materials following the Apollo 1 accident. The 1200 series of boilerplates were designed ‘in house’ and probably started life on the drawing board of Hardie Barr. He was responsible for the early examples, then known as LRD BPs. 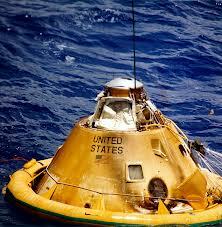 His particular pride was BP-1102/1102A, a capsule used by the astronauts for water egress training. The 1200 series were manufactured by a firm called Ace Fabrications in Clute, Texas, each costing some $10 – 15K. This a very good deal according to Hardie Barr. They were made of low-carbon steel, sand blasted and coated with ‘Dimetcote’, an inorganic zinc primer used for corrosion control, before they were painted. A few were made in the Block 1 configuration, these being converted to Block 2 at a later date. BP-1227 was most likely made sometime about 1967. Ace Fabrications no longer exists as it went out of business in the early 1990’s. It was owned and run by the Self family. Regrettably, when it closed the company records were destroyed. It has to be pointed out that there is not, nor was, any connection with a firm of a similar name that currently operates in the Houston area. Upon completion, BP-1227 was handed over to the Atlantic Recovery Force CTF-140 at the Naval Air Station, Norfolk, Virginia. Once allocated to this unit the boilerplate came completely under their control and it was CTF-140 that would organise and collaborate with other units needing a boilerplate to practice recovery techniques for a returning Apollo spacecraft. Despite several searches, where and to whom the capsule was sent remain buried deep within the records of the Port Services Department at the Naval Air Station. It has to be recorded also that though the chief of the design section kept a Rolodex file on the BP-1200 series to track their configuration status, this was lost when the LRD was disbanded in 1972. 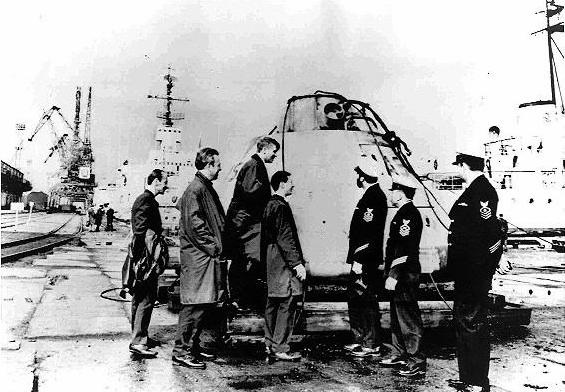 Apollo boilerplate capsule BP-1227 hit the news media when it was handed back by the Soviets in the early days of September 1970 during a visit by the Coast Guard cutter Southwind to the port of Murmansk. The usual dates for this are given as either 7th or 8th of the month though the private log of one of the Southwinds’ helicopter pilots, a Stephen Goldhammer, says it was a day earlier. His entry, timed at 18:00 on Sunday 6th September, reads, “We took on board a practice NASA capsule that the Russians had found somewhere. It looked like a dummy Gemini capsule. The Russian TV news said that one of the reasons for coming here was to pick up the capsule.” The helicopter pilot was not the only one confused by what exactly was to be handed over. A report in the European Stars and Stripes on 6th September says, “One Embassy spokeman said US officials had viewed the object Friday and could not confirm it was an Apollo program item.” There is support for the 6th as the hand-over date from an article in the New York Times dated 4th September states “… and would turn it over to a United States Coast Guard cutter in the northern port of Murmansk tomorrow.” At the hand-over were three people from the US Embassy in Moscow. These are reported as being William Harben, Franklin Babbit(t) and Richard M. Rodnia, the latter two being a Naval Attaché and a Military Attaché respectively. Efforts by way of FOIA requests to the US Embassy, Moscow and the Department of the Navy to either confirm their presence or the contents of any report they may have submitted have met with no response. Having received the capsule, the Southwind continued her Arctic cruise. Before sailing on to Thule, Greenland to take part in naval exercises she called in at Portsmouth, UK for what was scheduled as a three day visit. In fact she arrived three days early on 24th September, not departing until the 30th September. Contrary to some reports the boilerplate was not off-loaded here for return to the Royal Navy. Somewhere on this last stage of the voyage the capsule was nearly lost at sea for the second time as it began to break loose during a storm. There is a photo taken by a member of the crew showing some of the ship’s company chipping away the ice before making it more secure. Whether this incident took place in the Kara Sea (Encyclopaedia Astronautica) or Baffin Bay (USCG) remains unresolved as a query to the photographer was not answered. Also be aware that the Astronautica web site has been updated since this was noted. However, much of the original page still exists on the All Empires History Forum web site. The Southwind returned to home waters on 13th November 1970 when she docked at New London, Connecticut. It was here that the Apollo boilerplate was off-loaded for return to CTF-140. Eventually, the Southwind reached her home port of Baltimore, Maryland on 17th November. One crew member who was contacted during research for this piece thinks that a photo taken in Curtis Bay shows the capsule still on board. If this is correct, it means that BP-1227 had not been off-loaded when the ship arrived at Baltimore. 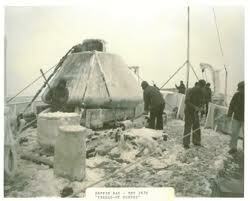 Once off-loaded the capsule was returned to the Port Services Department at Norfolk, Virginia. by what is loosely described as ‘… the usual regular supply chain between naval establishments’. This department was the unit responsible for maintaining the boilerplates allocated to CTF-140. They would have carried out any repairs needed before returning BP-1227 for service with the recovery force. Despite a FOIA request to the Port Services no information was returned as to the extent of the damage or the nature of any repairs. Once repaired, the capsule returned to service with CTF-140. As the Apollo flights ended with the ASTP mission in July 1975, the boilerplate was returned to the Port Services Department where it was placed in storage at the Naval Air Station. 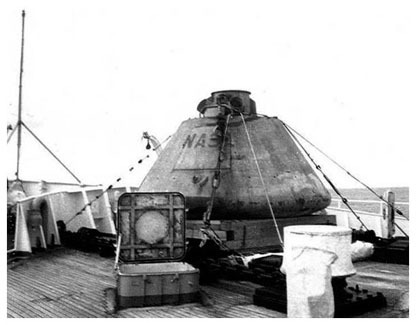 According to a letter dated December 1976 from the Naval Station at Norfolk to the Grand Rapids press it was “ … displayed at several events such as parades and open house activities and most recently during a visit of the American Freedom Train to Norfolk.” On 4th November 1976 title to the capsule was transferred from NASA to the Smithsonian Institution’s National Air and Space Museum. Almost immediately NASM loaned BP-1227 to Grand Rapids, Michigan to serve as a time capsule. The boilerplate went straight from Norfolk, Virginia to its new home. 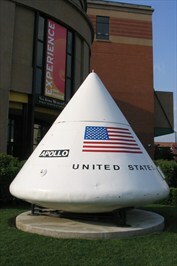 Ownership of the capsule was transferred from NASM to the Grand Rapids Museum on 28th March 1986. It is worth setting the background to a recovery exercise before dealing with how BP-1227 came to be in the hands of the Russians. Training exercises, particularly full ones, included the ships attached to CTF-140 for a specific Apollo mission. A recovery exercise would have the ship place the boilerplate in the selected location and then stand-off at about twenty miles distance whilst the ARRS unit homed in on the capsule using a SARAH unit. There is a clue that it was a ship that lost BP-1227 in the press accounts from 1970 when the London Times reported, “ … the Americans said it was probably only a dummy blown off a United States ship … “ This is repeated in the Kingsport News as “….but the U.S. space agency said it probably is an old dummy Apollo moonship that blew off a Navy ship two years ago .” Though the vessels attached to CTF-140 are known, thus far requests for information have produced no confirmation though several vessels have been eliminated. Nevertheless, it is worth noting that these exercises were also conducted at times other than for a specific Apollo mission and these ships remain unidentified despite requests to the Department of the Navy for the names of ships stationed at locations where such exercises were likely to have taken place. One should note also that there were undoubtedly exercises conducted by units that could be called upon in the event of an aborted mission outside of recognised mission time-lines. ARRS units at both Rota, Spain and Lajes, Azores had a boilerplate capsule assigned to them as is detailed later. They would have rehearsed recovery procedures fairly frequently outside of actual mission obligations. It is clear that all the quotes from various sources as mentioned above come from these two UPI releases, except for the original entry in the Encyclopaedia Astronautica. To discover the possible source for this one has to turn elsewhere as the following discusses. However, there are a couple of possible sources where this information may have come from. Both are Russian websites – kolamap.ru and astronaut.ru. The first of these places the loss early in 1970 when it was lost during sea trials off the coast of Britain. It goes on to say that the circumstances surrounding this event are not clear but that American intelligence agencies have undertaken special measures to keep it from prying eyes. The second is rather more explicit in its reporting, though there is some divergence in detail but it is closer to the original Day entry in Astronautix. With apologies for the translation it states that “Officially it lost in the fog the British Royal Navy sailors during a workout on rescue emergency.” It diverges when it comes to the location. This it places in the Bay of Biscay where it was picked up by a Soviet fishing vessel. From here matters get somewhat bizarre, the article going on the say, “Currently most of them [i.e. the boilerplate capsules?] are in American museums, but virtually no data on where they were used before (they) were the exhibits. However, we know that the Americans have tried to ensure secrecy of their workouts. Even the models, not to mention the actual product, trying to protect it from outside and, more importantly, the Soviet view. 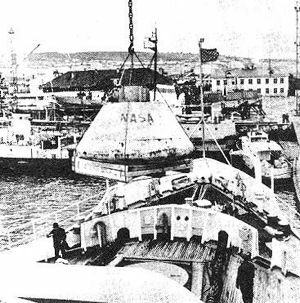 Nevertheless, the capsule with the number BP-1227 was in the USSR. Maybe it is to blame for all the fog …. Most experts exclude any chance of loss of the capsule. They believe that these events were the result of successfully conducted special operation. ….. . Therefore, it is likely that driving the monitor they are interested in the subject, the scouts took advantage of the fog or oversight of the Royal Navy sailors. Or maybe they were forced to lose the capsule. Apparently until the last moment they were confident that BP-1227 rests on the bottom of the Bay of Biscay. Only shortly before the arrival of ‘Saunvayda’ in Murmansk, through diplomatic channels, they were told the truth. ” As a parting shot it adds, “The scandal in Washington was grand.” before suggesting that this was one of the reasons that the then NASA Administrator, Thomas Paine, decided to resign. Make of this what you will, but it might be advisable to have a pinch of salt close to hand! Despite the above, it has to be categorically stated that there is no evidence to suggest that the Royal Navy was involved. A FOIA request to the Royal Navy Archives failed to find any record of involvement with this episode, the only reference to the Apollo programme being an offer to help at the time of the Apollo 13 flight. If not the Royal Navy, then which ‘UK based’ units? There was an ARRS unit based in the UK at RAF Woodbridge, Suffolk. From January 1970 this was the 67th having transferred in that month from Moron, Spain. At Woodbridge they would have had their own boilerplate to play with – BP-1206. Any recovery exercises from here were co-ordinated from Ramstein, Germany and they have no record of any loss. So, it seems most unlikely that those responsible for the loss were UK based. Now let’s turn to where BP-1227 was lost. One can rule out any suggestion that this event took place in the North Sea. The original Encyclopaedia Astronautica entry from Adam Bootle which stated that “ …. recovery forces lost an Apollo boilerplate in the North Sea.” has been deleted from the current version of the web page. Equally unlikely is the rather vague location of the loss as mentioned in the 1976 letter to Grand Rapids that says, “ …. were operating off the coast of England when somehow during the exercise it was lost at sea.” This statement is repeated on the plaque attached to the capsule as it serves as a time capsule. The US Coast Guard History web site places the loss much further south. To quote, “Apparently the US Air Force Aerospace Rescue and Recovery personnel who were using the 9500 pound capsule for training but lost it at sea near the Azores …. “ If this were indeed the location, it would have to be placed some distance from the Azores for the prevailing winds and currents to carry the boilerplate anywhere near where it was recovered. This said, the weight of evidence places the loss in the Bay of Biscay or in a location in the immediate vicinity where winds and currents would have the opportunity to blow the capsule to where it was recovered. It’s worth noting here that the prevailing wind and current in the Bay run south to north from October to March (i.e. the winter months) and from north to south during the summer months. Both US and Russian sources favour the Bay of Biscay as being the location of where the capsule was found and it is logical to assume that it was lost here too. The Kingsport News article has this to say about the location, “Tass, the official Soviet news agency, said the capsule that was discovered by Russian fishermen in the Bay of Biscayne off the coasts of Spain and France “. There is one other piece of evidence to suggest that this indeed was the place. To again quote from the London Times, “It was later reported by several ships off the coast of Spain as a hazard to navigation …. “ This information is repeated word for word in the Kingsport News but with the addition of a cryptic “ …. but we never could find it.” Requests to the Spanish and French Coast Guard authorities for clarification have gone unanswered. Bearing in mind that the Apollo capsules had a drift rate of about 10% of the wind speed and given the possible length of time BP-1227 was adrift before it was recovered then the Bay becomes the favoured place. Now let’s return to when the capsule may have been lost and when and where it was possibly recovered. It must be stressed that what follows excluded any practice exercises carried out by the ARRS units based at Rota and Lajes. These cannot be ruled out entirely as records were either not kept or, if they were, have long since been lost or destroyed. However, it is most unlikely that a simple training exercise would be carried out in unfavourable weather conditions. This leaves two occasions when CTF-140 recovery forces were engaged in recovery exercises in support of Apollo missions when conditions were conducive to mislaying a boilerplate capsule. To take this a little further one has to consider Apollo missions that fit as an acceptable time frame for this incident. These are Apollos 9 to 13. One may rule out Apollos 10, 11 and 12. The CTF reports on ‘10’ say that the weather for recovery operations was favourable throughout as it was for ‘11’ except for the last day of the mission in the Pacific. Unfortunately, the report for ‘12’ has not been found so far. So, it seems, one has to look at ‘9’ and ‘13’ to provide a possible solution. In doing so it cannot be too strongly stressed that what follows is very much circumstantial and is based on snippets of evidence that are often contradictory. To deal with ‘13’ first and examine those reports that would seem to point to this mission. It has to be said from the outset that consideration of Jim Lovell’s ill-fated flight has the flimsiest of the evidence. The Encyclopaedia Astronautica places the time of the loss, to quote “In early 1970 ….” as does the entry in Wikipedia. This would appear to be in agreement with a reply from the Department of the Navy that is rather ambiguous but says, “Researching in our office we determined that the capsule was lost at sea and recovered by the Soviets some time in 1970.” Whether ‘early’ extends to April 1970 isn’t clear, but this is the month when Russian reports claim the capsule went missing. In fact, according to one newspaper report an exact date may be placed on the event. On the night of 11/12th April, because of the weather conditions at the time, the recovery forces of the US Navy lost sight of the boilerplate. A Russian spy ship was shadowing these forces as the Navy had declared it a restricted area and it was this vessel that nipped in and picked it up. There are three things to note about this. First, it was common practice for a restricted zone to be placed round recovery exercises, though this was for safety reasons not secrecy. Second, the weather on the night in question was described as ‘squalls and snow’. This has been confirmed by a meteorologist as a reasonable description of the weather prevailing at that time. Third, these dates correspond to the date of a Soviet exercise ‘Ocean 70’ when the Russian nuclear submarine K-8 got into difficulties and eventually sank. The location of where K-8 sank is given as 480kms northwest of Spain. This puts it some distance from any likely recovery positions for either an Apollo recovery or from any exercises that may have been undertaken from Rota. So, it is most unlikely that the two events are connected, but it is strange that discovering answers relating to who, when and where have proved so fraught. So, to turn to Apollo 9 and the activities of CTF-140 as it prepared for this mission. Before looking in detail, it’s worth noting an anomaly associated with these retrieval operations. The Apollo Chronology, in the only mention of retrieval exercises that have been found, says that between January 24 – 29, “.. recovery training exercises were conducted aboard the U.S.S. Guadalcanal, the prime recovery ship for Apollo 9.” This would seem to be at odds with the CTF report which states that Guadalcanal conducted two training retrievals and day and night helicopter operations on January 16 – 17, with the USS Chilton making two training retrievals on January 29th. The report has no mention of exercises between these dates. There is one other incident in the preparations for the recovery of Apollo 9 that is worth recording. The CTF report records an incident when a capsule broke free. The CM was being raised by the Guadalcanal and was some three feet clear of the water when the crane lifting it failed, dropping it back into the water. Though still attached at this point, the swell caused the full weight of the capsule to jerk against the swivel holding it allowing it to disconnect. Might this have happened to a boilerplate as the Algol rehearsed retrievals? To turn to the involvement of the USS Algol. On 14th February she completed loading of Apollo recovery equipment before setting off to her designated abort recovery station. This is referred to as Station 3. By the 26th the Algol was in position to conduct a SIMEX (simulation exercise) with RCCA (Recovery Control Centre Atlantic) and ARRS aircraft. Three days later she carried out what is referred to as an ‘in house’ SIMEX. It is worth noting that the report records this as happening on the 29th February in what is clearly a typing error. Nevertheless, does this imply that the Algol had a boilerplate onboard? This would seem to tie in with a report in the London Times recording that according to a statement by NASA reported in September 1970 by the London Times that the capsule was washed overboard during a storm whilst in transit to an exercise off the coast of Spain. Later, on 3rd March, the Algol was released from its launch abort station to cover what is referred to as TP 13-2A and on 12th March was finally released from ship Station 3. In these manoeuvres the Algol steamed some 1650 miles. More to the point, the weather throughout was poor with high winds and seas. This is confirmed by contact with a crew member who recalls that the weather was just as bad and he remembers seas being between 20 to 25 feet with winds of 50 mph, just the conditions where a capsule might be washed overboard especially as he says also that the ship was being tossed about quite a bit. Strangely, he does not remember the recovery exercises that quite clearly took place. That the date of the loss of BP-1227 might have occurred in early 1969 and thus have a possible connection with Apollo 9 is to be found in a recently uncovered series of articles in the Russian press. What follows is uncorroborated and must therefore be treated with some caution. In 2007 there was first published an account of the recovery of BP-1227 by the Russian trawler Apatit(e). The memoirs of the chief engineer of this vessel – Alexander Andreev – were recorded by author Dmitry Ermolaev and printed in the Murmansk Komsomolskaya Pravda. The account was republished on November 29th 2014 in the Murmansk Gazette and for a third time on 28th February 2015 in the Murmansk Bulletin. The relevant passage from these articles reads, “Close to the device an orange container was floating, attached there by a steel cable”, says Alexander Andreev. “Our captain decided to take it on board. It was risky! The bow hoists can lift up to 3 tons and we didn’t know the weight of the floating structure. Fortunately, all went well, and the spacecraft boilerplate was fixed on the bow deck. In the container, which was attached to the boilerplate, we found a life raft, half-rotted blanket, and fishing gear. There was nothing inside of the boilerplate. Apparently, it served for rescue training operations of American astronauts and it was lost. 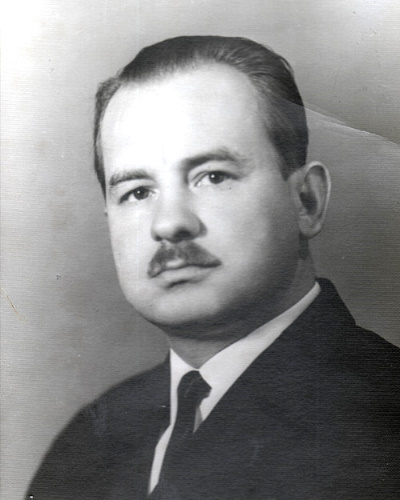 We sent a cable to Murmansk about this unusual discovery.” Andreev goes on to claim that the captain of the Apatit, Ivan Shankov, was given a hunting rifle by the KGB as a reward for finding and recovering what the authorities said was “… interesting and important.” The date when this is alleged to have happened is June 1969 off the coast of Spain near Gibraltar. Casting aside the doubts expressed above as to whether a humble fishing vessel would have had the audacity to recover something quite clearly marked as US property, there are other concerns that need to be addressed. Why was there a delay of nearly thirty years before Andreev came forward with his story? The handover in September 1970 was well publicised in the western press and we have seen that UPI issued a press release in Moscow at the time. Also one has to consider why there was nearly a year’s delay in the Russians informing US authorities that they had recovered the capsule. Why was it necessary to repeat the account of 1227’s recovery in 2014 and again in 2015? Lastly, why was it necessary to embellish the account of the appearance of the boilerplate with items – rotting blankets and fishing lines – that were most unlikely to be present during any recovery exercise? So, should one accept Andreev’s testimony as a true recollection of the finding of BP-1227 or are there sufficient doubts to raise concerns about its accuracy and therefore have to consider that there might be an ulterior motive behind it? Assuming for a moment that there is some truth in Alexander Andreev’s version of how the capsule was found, there is a possible answer to the questions raised by an intriguing episode in the Apollo story. Perhaps BP-1227 was washed overboard from the deck of the USS Algol to become a ‘hazard at sea’ in stormy conditions sometime towards the end of February 1969 whilst the vessel was on duty in support of the Apollo 9 mission. 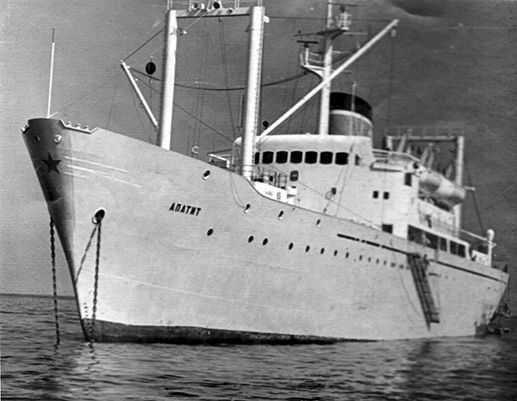 It remained adrift in the eastern Atlantic for three months, eventually finishing up off the Spanish coast near Gibraltar where it was spotted and recovered by the Apatit in June 1969. As we have seen, there is sufficient evidence to make this a plausible solution. It has to be stressed that there is no hard evidence that this is the case for despite FOIA requests to all the relevant bodies concerned, they claim either to have no records or that no records exist. There is, however, one case in particular where an answer might be found. This concerns the logs of the Southwind. They are held at NARA, 14700 Townsend Road, Philadelphia, Pennsylvania 19154-1096. The Accession/Locator numbers are F-03-16-05-5 through F-03-16-06-1. Despite three FOIA requests neither acknowledgement nor answer was received. Later, in 1971 the CIA in a report on a National Intelligence Estimate of the Soviet Space Programme stated that “Nearly all past efforts by the US to induce the Soviets to engage in cooperative or joint space programmes have met with limited success.” The report goes on the record that in October 1970, a month after the return of BP-1227, talks began on the desirability of compatible Soviet and US rendezvous and docking systems. Finally a personal note. It may be that I’m on the wrong side of the Atlantic to unlock the doors that might lead to providing a definitive answer to the circumstances surrounding the loss and recovery of BP-1227. I’m more than happy to turn over this investigation with the hope that whoever takes it up has more success than I have had.